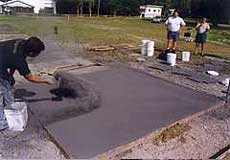 This system uses a 4,000 psi (29mpa) concrete mix design reinforced with fiber, which is then integrally colored with one of 36 integral colors, and placed in accordance with ACI standards. 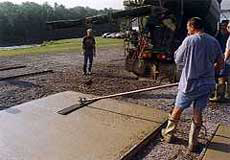 Prior to imprinting the surface, a Stampcrete colored release agent is applied. This release agent acts as a curing agent, releasing agent, and gives the surface a two-tone look. 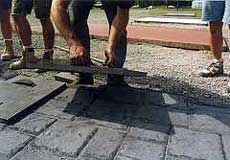 The surface is then imprinted with one of 40 designs, including brick, European cobblestone, and ashlar slate, to name a few. 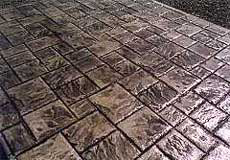 The release agent is removed, concrete control cuts are placed in accordance with ACI standards, then the surface is sealed with two coats of sealer to protect it from fading or staining and from all of nature's elements. 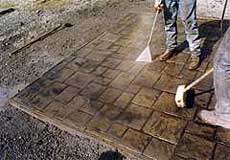 Using color hardeners can also enhance the Stampcrete System. 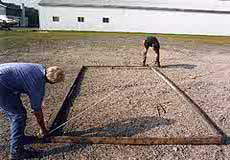 The company manufactures over 24 color hardeners.